Every Japanese family has its own crest which is displayed on their formal kimonos. 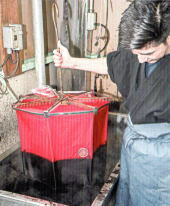 After the kimono is dyed black, leaving the crest part in white, a Yuzen dyer adds the details of the family crest on the kimono by hand. Kuro-montsuki-zome of Nagoya is quite famous for its stark-black dyeing tone and the distinctive crest image.